Good eye contact is critical to a successful tee shot. 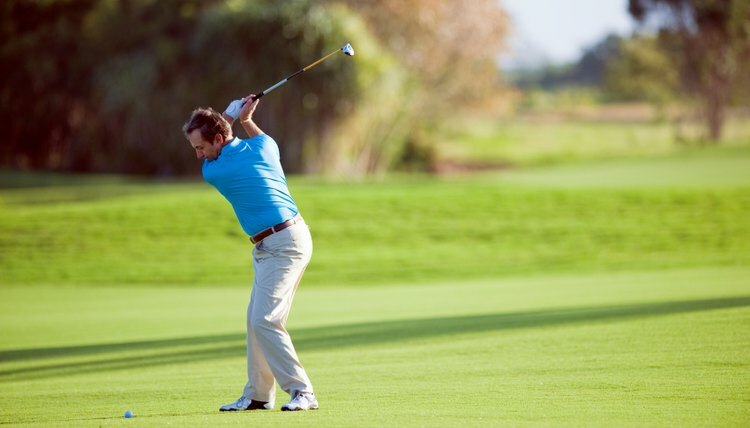 The golf swing is a complicated series of actions that ideally lead to the ball stopping close to the hole. A variety of factors are necessary to make solid contact with the golf ball, including a pre-shot routine, alignment, swing arc and tempo. Understanding the aspects of the golf swing necessary for contact can help golfers hit better shots and record lower scores. Lining up a shot square to the target is the first necessity for contact. A square setup means that the golfer’s feet are lined up parallel to the target line. To check whether a golfer is lined up square to the target, take a stance and set a club on the front of the toes. If the club doesn’t point toward the flag, recheck the alignment. The other key to the proper alignment is having the shoulders parallel to the target line. Hold a golf club against the chest to see whether the shot is aligned properly. The alignment is the position of the ball in the swing. The ball alignment changes based upon which clubs is being used in the shot. If a driver or wood is being used, the ball should be played just off the front heel. If the club is a long iron, the ball should be played about an inch or two farther back. If the golfer is hitting a short iron or a wedge, the ball should be played toward the middle of the stance. The feet together drill is one method for practicing elements of making contact like weight shift, the take-back and the follow-through. On the driving range, address the ball, but have the feet next to one another. Take the club back to about waist height. At that point in the swing, the toe of the club should be pointing straight up in the air. Bring the club back down, hitting the ball and following through. Stop the follow-through at waist height. At this point the toe of the club should be straight up in the air. This drill helps with rolling the wrist and making solid contact. Keeping a consistent tempo is important for solid contact. Some golfers think swinging hard will lead to more distance, but consistent contact in the backswing and follow-through will help golfers make solid contact–the key to greater distance. Practicing on the driving range is important to making good contact. Practice swing details before trying them out on the golf course.